The following drop-down menus provide links to current Laborshed data by geography. The data is provided in two formats. The first drop-down for each geography type (city or region) links to an interactive presentation-style narrative of the data collected for the area. The second drop-down provides an executive summary, in a PDF file format, for each area. The drop-down menu below provides data for the most recent statewide study. All reports are PDF files. Current Laborshed data can be viewed and explored in the Tableau visualization below. Navigate the various visualizations by using the tabs at the top of the frame. To customize the view, adjust the available filters to select the geography your are interested in as well as the category and/or subgroup. 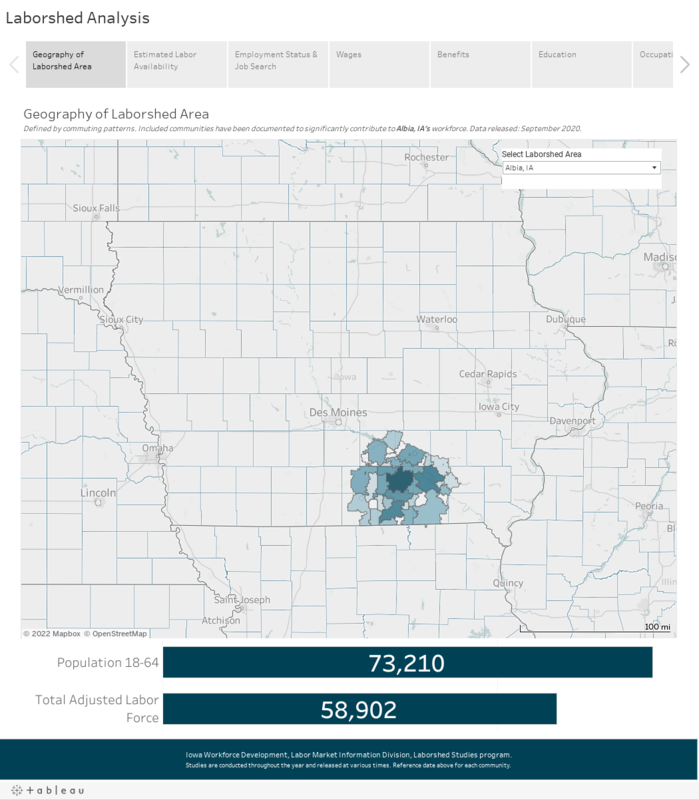 If you need access to additional Laborshed data or need it presented in a different format feel free to contact the Laborshed team with your request: Laborshed.Studies@iwd.iowa.gov.